Even the best-maintained car will have parts that start to decline over the years. Some parts degrade slowly allowing you to monitor the progress and fix at your leisure, and others could give way more suddenly, creating a driving hazard. Tie rod ends can go bad, fast. 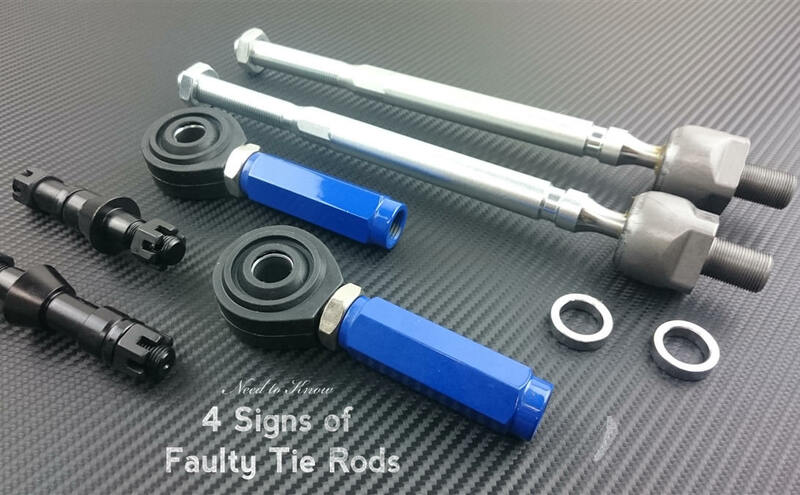 As a critical part of the steering linkage, it’s important to recognize the early signs of tie rod ends going bad before driving becomes dangerous or the issue causes damage to other parts. Driving too fast over uneven surfaces and knocking your front wheels on stationary objects are just a couple reasons why your front end gets kicked out of alignment. Tie rods often take the brunt of the impact in those type of driving conditions and you can develop a pulling sensation either to the left or the right while driving straight ahead. It’s a good possibility that the tie rod ends would require replacing. Uneven tire wear is a key indicator of when your vehicle is out of alignment. Do a visual inspection of your tires, and if you notice worn down areas of excessive wear on the outside or inside edge of the tire, there’s a strong possibility you have a tie rod issue. In this case, you should have the tie rod ends checked by a professional. As a tie rod goes bad the tie rod will become loose. This requires a physical check of the amount of play in the tie rods by lifting the front wheels off the ground and testing how much side to side movement there is. Rocking it back and forth you should not feel any “freeplay”. If you do then it should be addressed right away before metal fatigue causes sudden breakage while driving. You can often feel a bad tie rod transmit vibrations through your steering wheel when you’re driving. If your steering wheel shakes and vibrates excessively while driving, this could be due to a tie rod badly deteriorated. It could also be the tires are out of balance or separated. You need to get yourself to a mechanic asap. If your tie rods fail at highway speed, you could lose control of your steering wheel, and risk causing serious injury to yourself and your fellow drivers. If you suspect you have a worn out or faulty tie rod, bring your car in for an inspection immediately and we will get you back on the road quickly and safely.